Sylvie Euvrard is a hospital practitioner in the Department of Dermatology of Edouard Herriot Hospital in Lyon, France and is responsible for the specialized unit for skin care of organ transplant patients since 1991. 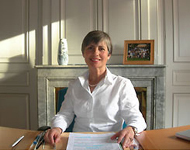 Since 1994, she is the coordinator of the French group "Peau et Greffe d’Organ" Section of the French Society of Dermatology (www.sfdermato.org) and has been president of the "Skin Care of Organ Transplant patients (SCOPE) " from 2005 to 2008. She wrote more than 30 book chapters and is author of 110 articles on skin diseases after organ transplantation in peer-reviewed journals including the New England Journal of Medicine, Lancet, Cancer, and most Transplant and Dermatology journals. She is the co-editor of two books, “Skin diseases after organ transplantation” (John Libbey Eurotext, 1998, Paris, EJD book series) and ‘Skin cancer after organ transplantation” (Springer, Cancer Treat Res 2009). She is also an invited reviewer for many journals such as New England Journal of Medicine, American Journal of Transplantation, Transplantation, Transplant International, Nephrology Dialysis Transplantation, International Journal of Cancer, Journal of the American Academy of Dermatology, British Journal of Dermatology, Archives of Dermatology etc.